1 of 3 Remove 12 small bowl-shaped leaves from head of lettuce; rinse and set aside. 2 of 3 Heat oil in a large nonstick skillet over medium-high heat. Cook garlic and ginger for 30 seconds. Stir in peppers and cook for 2 minutes. Add beef and cook for 5 minutes. Drain off any accumulated fat in the pan. 3 of 3 Stir in stir-fry sauce and cook for 1 minute or until thickened. 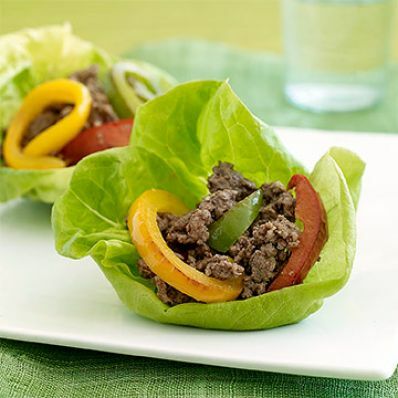 Spoon about 1/4 cup beef mixture into each lettuce cup and serve. Per Serving: 8 g Fat, total, 70 mg chol., 3 g sat. fat, 2 g fiber, 609 mg sodium, 215 kcal cal., 26 g pro., 8 g carb.